Why do millions of people enjoy the ultimate sleeping experience? 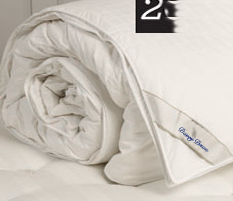 Davey Down brings you luxury duvets filled with goose down, as well as a range of other down-filled products, including pillows and mattress toppers. We're passionate about selling down duvets to individuals and businesses. Our experience means we know all there is to know about our down duvets and products and the many benefits that they offer our customers. You can get everything that you need from one place with our comprehensive service, whether shopping for your home or for your business, such as hotels and other luxury accommodation. Our pillow range includes goose down, microfibre options and even Danish pillows filled with revolutionary Fiperla filling. Our luxurious mattress toppers provide extra comfort, while mattress protectors help to protect the investment you have made into your quality mattresses. Keep your beds looking smart with our linen range, including fitted and flat sheets, duvet covers and pillow cases. If you suffer from Asthma or other allergies find out more as we have products can help. The Davey Down collections have been specified by us for you, exclusively sourced from some of the world's leading factories. We spend considerable time visiting these sources across the Globe to ensure continued quality of existing products but also to find new products for you. It was an absolute joy doing business with you and I won't hesitate to do so again.